It is a great pleasure for me to join you at this dinner. I am delighted to celebrate this third anniversary of the founding of Young Icebreakers. I was at your second anniversary and I am glad to observe how the Young Icebreakers have grown stronger in the past year. Also, I must congratulate the Young Icebreakers on what you have achieved in the last three years. Most notably you are putting new energy into the best of 48 Group Club ‘Icebreaker’ traditions. Vitality and creativity are unique strengths of young people. I see how you are using these advantages to build bridges of understanding and dialogue between the younger generations of China and the UK. For that I must offer you my appreciation. I was delighted that several Young Icebreakers attended. During the past fourteen months I have been at many gatherings of young people. At all of these I have been impressed by the enthusiasm the young people of our two countries have shown in engaging each other in deep exchanges. This enthusiasm can be seen first and foremost from the surge in mandarin learning in this country. 13 Confucius Institutes and 54 Confucius Classrooms have been opened. This is more than any other country in Europe. Hundreds of British schools have put mandarin in their curriculum. I am impressed by how well some young people of this country can speak mandarin. A British young man won the top prize at the 9th “Chinese Bridge” Chinese Proficiency Competition last year. Not long ago I had the pleasure of watching the UK Regional Final of the 10th “Chinese Bridge” competition. I hope these young contestants will renew last year’s huge British success in China this summer. The enthusiasm about closer engagement is also reflected in the exchanges of students. China now has nearly 120 thousand students studying in the UK. This makes the UK the largest European recipient of Chinese students. It means that China is the number one source of overseas students for the UK. The number of British students in China is also on a steady rise. The total number last year reached over 3,200. This seems modest compared with the number of Chinese students in the UK. But given the much smaller British population, 3,200 is a significant number. The universities of our two countries have shown a keen interest in expanding their academic links and cooperation. This is a good way to bring together the best resources to train young people who are able to meet international needs. I would like to highlight two examples. Firstly, the Ningbo Campus of the University of Nottingham. This is China’s first university jointly funded by China and another country. Second, the Xi’an Jiaotong-Liverpool University. This is China’s first cooperative university. But let us also not overlook the importance and value of the hundreds of degree programmes jointly run by Chinese and British universities. Youth exchanges are another highlight in our shared objective of winning deeper understanding between our two countries. 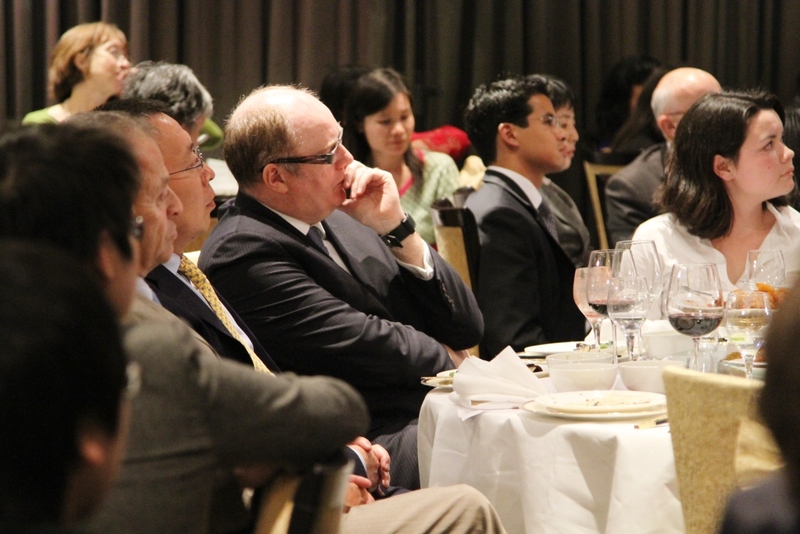 We successfully concluded the China-UK 400 programme last year, and have been exploring new ways of youth exchanges. 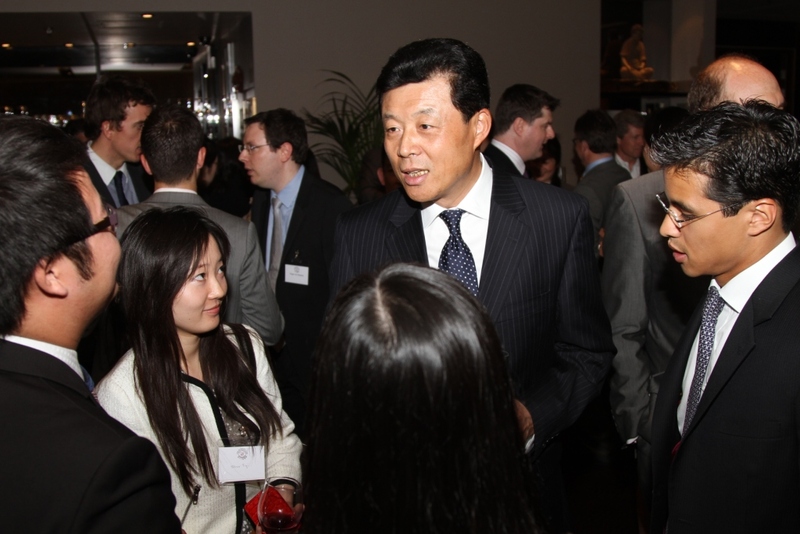 For example, the first China-UK Young Leaders Roundtable was launched last year. Also I was delighted that the Young Icebreakers proposed to Vice Premier Li Keqiang the idea of hosting an annual Sino-UK young people’s forum. I am very pleased to say this idea was warmly welcomed and preparation is underway. I take this opportunity to wish you all the best with this initiative. Premier Wen Jiabao stressed the value of youth exchanges in one of his meetings with your Chairman Stephen Perry. Young people represent the hope and future of our world. As long as young people of our two countries deepen mutual understanding and friendship, China-UK relations will gain in strength. The exchanges will reduce misunderstandings, foster greater trust, generate economic gain, and enrich our lives. This will in turn contribute to peace and development of the world. What we need to do is to explore the means to maintain the momentum of close exchanges. Here are some of my thoughts on how we could make this happen. First, on increasing mutual understanding. I very much hope that the young people of our two countries could learn more about each other’s country. Searching the internet and reading from the media can be a start. But we must encourage much deeper study. This study should involve more first hand experience of the other’s country, such as visiting, working and living there. This would help enrich your knowledge of China. In Britain I have learned that you have a very robust and energetic discussion about China. And I have observed that there is a tendency to stress the negative rather than the positive. So we have a shared need to encourage British young people not to be misled by negative comments, misreading or even prejudice against China. The important thing is to have deeper independent thinking about China. I hope you will observe and find answers yourselves to the following questions: why China’s development means opportunities, not threats to the world; why the second largest economy in the world is still a developing country; why China is committed to peaceful development and will never seek hegemony or expansion; why the overwhelming majority of the Chinese people are confident about their country’s future. For those of you here with a close interest in China I would encourage you to not only share your stories with friends and family members, but also write down what you see and hear about China. In this way you can share your thoughts with newspaper readers, internet users and micro-bloggers and more people will get to know the real China in all its aspects. Secondly, I suggest you use the creative strengths of your youth to communicate. So I urge you – both young women and men! I urge all of you to use your energies towards gaining more creativity to improve communications between China and the UK. Your efforts are urgently needed. The reason is that the changes in China for the past decades have been unprecedented in human history for any one country. This scale of change means that it becomes ever more urgent to build deep understanding between China and the whole world. The speed of change makes it vital to build respect for different cultures. There is a natural human response that everyone in the world should be the same as us with the same values. Travel in the world shows there is vast variety in cultures. Respect for these differences is a critical condition if we are to achieve the goal of sustainable and peaceful development of the world. I encourage you to harness the energy of your youth and explore new bold and creative ways. This could include wider use of the latest digital tools to make future events more interesting for all young people. The themes of exchange programmes should be carefully designed to reflect the spirit of our time. In this way you can match the interests of British young people and so mobilise their passion and creativity. You have a great responsibility. You best know how to fire the imagination and interests of your own generation. Your success in that task will determine the success of continued exchanges. In turn that will be the crucial determinant for the strength of our future bilateral relations. Turning to my third personal point of advice. I encourage you to use your influence with future programmes. Exchanges between young people of our two countries should have some flagship programmes that are capable of attracting more people. There are two good opportunities in front of us. The first is the London Olympic Games. The second is the celebration marking the 40th anniversary of full diplomatic relations between China and the UK. Doubtless you will have your own ideas about expanding and extending exchanges. I very much look forward to learning about these. Overall I hope we can meet our mutual objective to influence more and more young people to take an interest in learning about our two countries. In this way we can sow the seeds of cooperation and friendship in their hearts. I am confident that we start from excellent foundations. We have the strong support of our two governments and various sectors. We already have the active participation of many of our young people. We have the advantage of the longstanding commitment of organisations like the 48 Group Club and we now have the Young Icebreakers. From these foundations I know we will see more vibrant exchanges between our young people. In this way I am confident that China-UK relations will grow from strength to strength. On 10th May, the 48 Group Club Young Icebreakers hosted a dinner to mark the 3rd anniversary of its founding, and nearly 200 guests were present, including Chairman of the 48 Group Club Stephen Perry and Chairman of the Young Icerbreakers Daniel Jacoel. 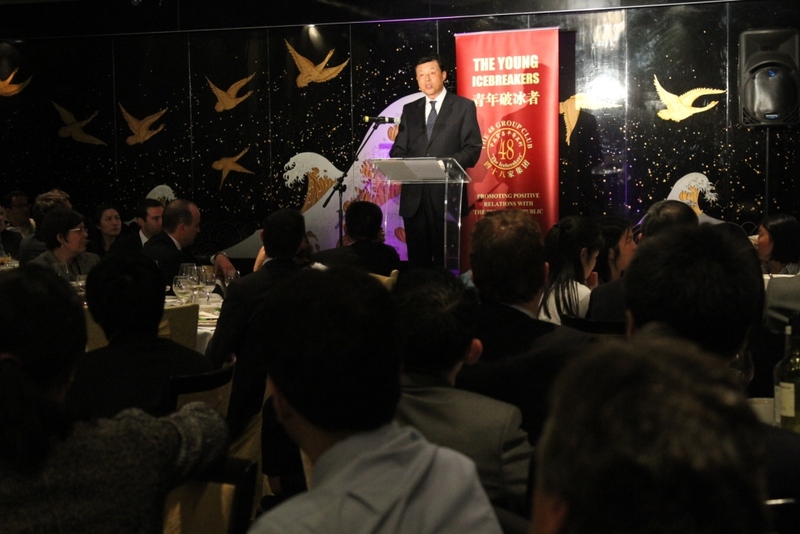 Ambassador Liu Xiaoming attended the dinner and delivered the above keynote speech. Mr Perry spoke after Ambassador Liu. He commended Ambassador Liu’s speech, saying that Ambassador Liu’s thought-provoking view about exchanges and mutual understanding between China and the West had touched upon the most important factors affecting China-West relations. He said that since the 1950s, the 48 Group Club has been actively involved in cooperation with China with a firm belief that China, as an ancient civilization, will surely return to peace and revival, and this belief is turning into reality today. People who embrace China with open arms will win opportunities and peace, while those who fear and try to contain China’s rise will only create confrontation and disaster. He expressed the hope that young icebreakers will keep alive the tradition of the 48 Group Club to promote youth exchanges between the two countries and seize the opportunities presented by China’s development. 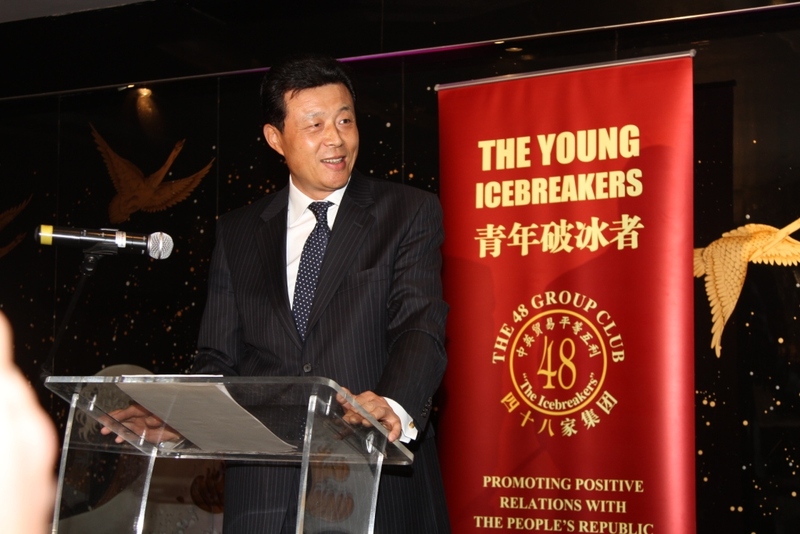 Founded on 1st May 2008, the 48 Group Club Young Icebreakers is committed to promoting exchanges and cooperation in education, culture and business between young people of the two countries and contributing to China-UK relations. Premier Wen Jiabao and Vice Premier Li Keqiang met with young icebreakers during their respective visit to the UK.